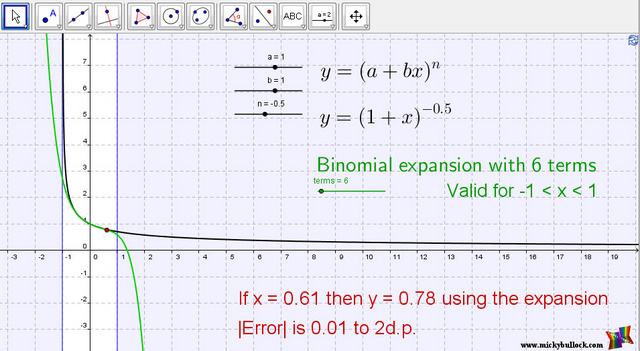 Also control the number of terms in the binomial expansion. The applet shows the correct function (black) alongside the binomial expansion of the function (green). It also clearly shows the bounds (x-values) for which the expansion is valid. Note that the validity bounds are independent of the number of terms in the expansion. i.e. an expansion may be ‘valid’ for a particular value of x, but this does not necessarily mean the approximation is good; you may need more terms in the expansion. GeoGebra: Probability Venn Diagram with Proportional Regions GeoGebra: The Ultimate Projectiles Applet!